If you are someone who frequently works out at the gym, I can understand if the music at the gym is abysmal. It is a common issue that I have faced, along with many other people have faced as well. The only thing that you can do aside from changing the gym is investing in a pair of headphones that get the job done. Now you can pick up any pair of headphones and that will do the job. However, if you workout with great intensity, you are going to need to get the best workout headphones. These headphones are aimed for people who are all about working out. They are normally sweat proof, and they have a design that allows them to stay in your ears without falling off. You will find plenty of good workout headphones in the market, but considering the saturation, you might not have an easier time finding the best possible option. In this article, we will be looking at 6 of the best workout headphones you can buy in the market. The purpose of keeping this list small is to ensure that our readers are not confused by the sheer number of options available. The first option we are looking at is a truly wireless offering from a company that has long established its domain in the wireless headset or headphone domain in the market. For those who have not guessed yet, we are talking about Jabra. 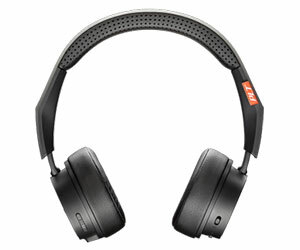 The product we are looking at is the Jabra Elite 65t. A pretty high end, truly wireless solution for people who are getting away from wires completely. 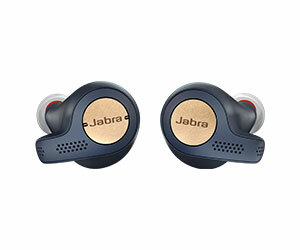 The good thing is that Jabra has done a great job designing the Elite 65t; they look great, yet not in your face. Using them is an absolute pleasure since they are the easiest truly wireless earphones you can get your hands on. The battery life is excellent for the small size, you get around 5 hours, or more if your usage is moderate, which is great. Lastly, Jabra has done a great job with the sound quality as it happens to be one of the most balanced earphones we have tested. There are a few downsides; the case, along with the earbuds are slippery, and you do not get a lot of ear tips to choose from. Another noticeable thing is that the Jabra Elite 65t are not fully water resistant. Great design that looks professional. There are not enough ear tips to choose from. Plantronics is another famous company responsible for some pretty amazing earphones and headphones in the market. They are largely focused on releasing products that are sports oriented, and are made for people who prefer working out and listening to music at the same time. Today, we are looking at the Plantronics BackBeat Fit 2100, one of the cheaper alternatives in the market, but still pretty amazing. 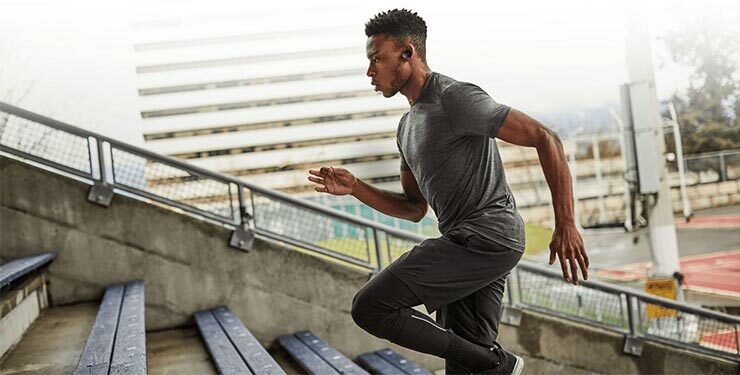 While not fully wireless, the Fit 2100 offers a rugged rubber design that aside from being sweat proof, is also waterproof. They fit is great, and allows ambient noise in, this is important when you are commuting, or working out, because environmental awareness is important. The earphones are comfortable for as long as you want to wear, and you can even map different functions onto the button from the app. 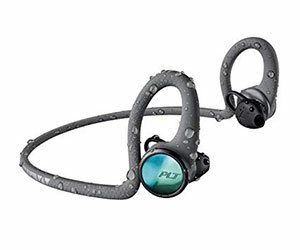 The only department where the Plantronics BackBeat Fit 2100 is lacking is the sound department as it does not sound as good as some of the competition available in the market. 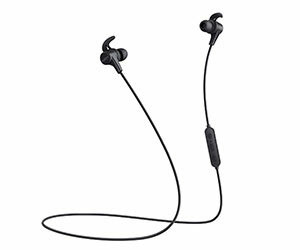 Overall, the Plantronics BackBeat Fit 2100 are a great pair of earphones that only lack in terms of sound quality. Comfortable to wear for longer period. Great design that is rugged, sweat proof, and water proof. The button on the earphones can be mapped accordingly. They allow the ambient noise in. The sound quality is a bit lacking. Aukey is one of those companies that are well known for their charging products. So, their foray into the earphone market was surprising, to say the least. Today, we are looking at one of their offering that is intended for active users. We are looking at the Aukey Latitude EP-B40; these budget oriented earphones are for people who are not looking to spend a lot of money but still want a decent sounding pair of earphones. The sound quality on these is rather great, especially for the price you are paying. Additionally, the battery life is excellent too, with a single charge giving you around 8 hours. Last but not the least, you also get a built in equalizer that is a great touch. With all the great things aside, there is not anything functionally wrong with the Aukey Latitude EP-B40. However, if you are using a modern-day smartphone, you won’t be able to use the assistance like Google Assistant, Siri, or Bixby for that matters. Overall, the Aukey Latitude EP-B40 are a great pair of earphones for working out, and the best part is that they do not even cost a lot of money. You can get some great sound, and battery life from them as well. No way to call virtual assistant. If you are looking for full sized headphones rather than in-ear monitors, then the good news is that Plantronics has got you covered. Like I have said before, they have an impressive portfolio of headphones as well as earphones. Today, we are looking at Plantronics BackBeat Fit 500, an over-ear headphones for people who are looking for great sound. Now the sound is great, the bass is powerful , and responsive, and the high frequencies are bright as well. The fit of the earphones is as comfortable as it can get, and the best thing is that the controls on these earphones are some of the easiest I have seen. Another great benefit is that the design of the headphones is sweat proof, so you really won’t have any major issue whatsoever. As far as sheer performance goes, the Plantronics BackBeat Fit 500 are not an easy pair to beat. However, the included cable does not come with an inline remote, and that can be an issue for some people. 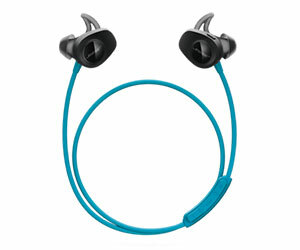 In conclusion, the Plantronics BackBeat Fit 500 are a great pair of overhear sports headphones for those who want great sound and a great performance. There is nothing immediately wrong about the headphones that make this a great option to have. Powerful bass with pronounced highs. The cable lacks an inline remote. Bose is one of those companies that need no introduction, for the longest time they have released some really amazing products. Whether you are talking full sized headphones, or you are talking about earphones, the options are certainly there for those who want them. Today, we look at the Bose SoundSport Wireless Headphones. They are super comfortable to wear for as long as you want. Additionally, the earphones are sweat resistant, so you won’t have to worry about anything. They also sound great, and the best thing is that they fit in your ears without any issue thanks to the winged tips. If you want to make phone calls, the earphones work great as a headset, and they even come with an auto-off feature, which is great for saving battery. There are not a lot of issues with the earphones to begin with, but if you are buying something premium, you would expect a good battery life, but sadly the battery on these last about 6 hours tops. The Bose SoundSport Wireless Headphones are great, with a ton of features, minus the average battery life. If you are okay with this setback, then you should not have any issues with the otherwise great offering. Great for calls as well. Anker is generally hailed as one of those 3rd party companies that are doing some great work in the market. Their charging cables, as well as their power banks are among the best we have used. However, today, we are looking at something different. Today, we look at the Anker Soundcore Spirit X Wireless. One of their top of the line sports earphones that provide you more than you are going to pay for. You get a carry case, as well as a variety of ear tips, and ear wings. The battery timing is great with 12 hours on a single charge, and the earphones only take 1.5 hours to charge to full. While there is no active noise cancellation, the passive noise cancellation happens to be really good. While the earphones are packed with features, and they sound great too, there is some high pitch issues. Overall, the Anker Soundcore Spirit X Wireless are one fine pair of earphones especially if you are not looking to spend a lot of money. If you are okay with slightly higher pitch in certain tracks, these are the best bang for your buck. Takes only 1.5 hours to charge. There is some high pitch in certain tracks. Finding the best possible headphones for working out can be a complicated process. However, the thing is that the market is so saturated, that it can easily lead to confusion. Especially if you are new to the market. The good thing, however, is that with this list, you are going to find some of the best earphones you can buy in the market. 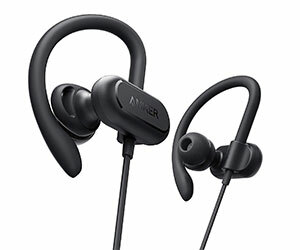 Now if you ask me for the best possible earphones from the list, I would have to go with the Anker Soundcore Spirit X Wireless. Simply because these earphones give you a great value for money, and considering how wireless earphones are often marred by middling battery life, these earphones take that assumption out of the window with their amazing battery life. In case you think we have missed any other important suggestions, feel free to let us know, and we will have a look at them again.